Matlock Town joint boss Craig Hopkins labelled his side’s defending as “unbelievable” and promised to address issues at both ends of the pitch, as the Gladiators continued to hand points to their opponents in the last two matches. Marine notched a late equaliser with Matlock looking odds on for a second home win on the trot last Saturday before two more gifts including one in the 88th minute led to their downfall at Barwell on Tuesday night. It is becoming a familiar tale of woe for Matlock who lie down in 16th spot after an encouraging four game unbeaten run at the start of the season. Hopkins added that missed chances at the other end are also a problem at present. “We’re missing too many chances,” he said. “As a group they’ve worked hard and didn’t deserve to lose but we missed chances in that opening half hour when we were on top, it’s happening time after time, but when it does we’ve got to ensure we don’t gift the other side the first goal. 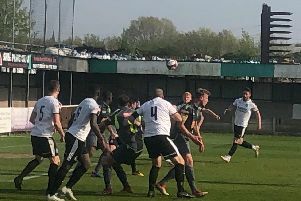 Hopkins admitted that the failure to beat Marine last weekend was a “massive blow” particularly after a good win in midweek. “We had so many chances in the first half, Marine score on the only occasion they made it into our half, we couldn’t believe we were behind at half time,” he said. A lack of confidence and injuries could be contributory factors as Hopkins acknowledged but he countered: “Eleven games in we might not have had the rub of the green but we can’t feel sorry for ourselves. Rhys Sharpe, Luis Rose and Nico Degirolamo all picked up injuries at Barwell as did Shaun Harrad who was in discomfort afterwards with a throat injury after a horrific challenge on the stroke of half time. Callum Lloyd missed out altogether on Tuesday and with Marc Newsham also out and Michael Williams probably needing another couple of weeks yet, it’s a testing time for the Matlock management team who will probably need to recruit very soon. That need was exacerbated as Ryan Wilson departed to join AFC Telford United, but Matlock did add a new face ahead of the Barwell visit as former Ilkeston FC, Notts County and Kidderminster Harriers striker Tyrell Waite joined on loan from Boston United. “Tyrell’s quick and strong and did very well in his first game,” said Hopkins. “We’re working hard to add to the squad and in the games we’ve played I don’t think the opposition in any of them has had more chances than us. The games come thick and fast for Matlock who face two difficult examinations in the next few days. On Saturday it’s the long trek to Workington to be followed on Tuesday by the visit of second in the table Shaw Lane. There is a fixture alteration on Saturday week with scheduled opponents Stourbridge on FA Cup duty. Matlock are awaiting notification of their new opponents from the Evo-Stik League.